UJUC Rabbi makes Judaism Accessible and Engaging for ALL. Rabbi Ken Hahn listens with open ears and an open heart making his newest endeavor, training to become an interfaith hospital chaplain, a perfect vocation. Steven Blane, founder of the UJUC, stated: “Rabbi Hahn is a builder of connections among different people and cultures. Rabbi Hahn’s work epitomizes the essence of Jewish Universalism”. UJUC Rabbi makes Judaism Accessible and Engaging for ALL. Rabbi Ken Hahn listens with open ears and an open heart. Rabbi Ken Hahn of Northhampton, MA, has dedicated his rabbinate to bringing the depth and beauty of Jewish wisdom to practicing Jews, the non-affiliated, the disaffected, and to non-Jews. 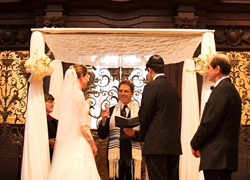 Rabbi Hahn serves his community by assisting with weddings, baby namings, bar/bat mitzvah tutoring, and funerals. Rabbi Hahn is also a life coach assisting those who desire to transform their lives and their situation, and he is currently training as an interfaith hospital chaplain at the Baystate Medical Center in Springfield, MA. Rabbi Hahn was ordained by the Jewish Spiritual Leadership Institute (“JSLI”) in January, 2016. Prior to this ordination, Rabbi Hahn earned his MBA from Yale and his BA from Harvard. Rabbi Hahn worked for over 20 years running a non-profit educational travel organization he founded before he left it in 2012 and began his rabbinical studies. Sim Shalom is an interactive online Jewish Universalist synagogue, which is liberal in thought and traditional in liturgy. Sim Shalom provides accessible and short services every weeknight and Shabbat and additionally Sim Shalom provides online education programs, Jazz concerts, and conversion and life cycle ceremonies. Rabbi Blane is also the founder and director of the Spiritual Leader’s Institute, http://www.jsli.net, the online professional rabbinical program.